You are here: Home / Spiritual Growth / Do You Only Talk To God In Times Of Need? Do You Only Talk To God In Times Of Need? Don’t we treat God this way at times? One particular day I was feeling overwhelmed and after I tried to do everything I could possibly do myself, I felt helpless. I sat down on my couch and started to plead my case to the Lord asking for help and guidance. Almost immediately after, I heard God’s still small voice say, “Hi.” Just like my friend responded, I felt God’s response was the same. I hadn’t talked to God for some time and here I was only talking to Him when I need something. Do you only read the Bible when you’re desperate for some answers? Do you only pray out of a season of testing and difficulties? Do you only cry out the name of Jesus from a place of need? There’s going to be really great moments in life. 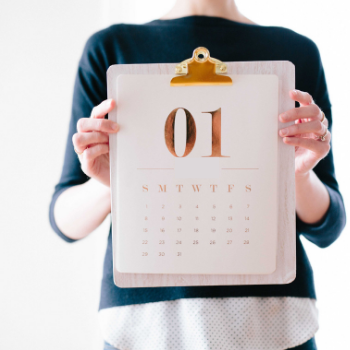 Whether they’re when you get married, have a baby, make an exciting move, receive a job promotion, or travel to a place on your bucket list. There will be seasons of tremendous blessings and growth and these moments will excite us, make us feel like we can conquer the world, or simply make us feel we’re so blessed so nothing else matters. These are the mountain tops of our life. I had a literal mountaintop moment when James and I traveled to Israel to study for a semester with our university. We went to Ein Gedi, a natural park in Israel and also where David ran for hiding and wrote many of the Psalms. As we were climbing up this mountainside and were told that when we got to the top we would have time to pray and journal. When we arrived at the summit everyone immediately spread out and started their alone time. I turned around to see the view behind me; there was water running down the side of the mountain, the Dead Sea out in the distance, and the country of Jordan on the other side. I have no words to describe the amount of beauty that was in front of me. I’ve never seen anything like this and for the first time in my life, I can understand the scripture in Romans that shares how we will know who our creator is by His creation. The top of the mountain is a very important place. It’s where we can look out and remember the valleys and the hard seasons that formed you into who you are today. We can look down at the valley and remember the goodness of God and His faithfulness. We cannot forget God here. We cannot forget God from the mountaintop. These are times to celebrate with Him and shout His praises for His blessings. The top of a mountain is a beautiful place to be because it gives us great perspective. Be honest with yourself, how many times do you forget God when you get to the top of your mountain? You forget to stop and turn around and see everything below. You don’t stop and take a deep breath and remember the journey that got you there. Everything is so good you become selfish with that time instead of having a heart of thanks and gratefulness. Even though no one wants the valley you can’t have mountaintop moments in life without them. The valley is a place to learn and grow so when we start climbing again we’re prepared. It’s a place full of God’s grace, forgiveness, comfort, and promise. In the valley is where we can experience a side of God that exists in those hard times. When I think back through times of hardship in my life, I remember Jesus and Him being ever present. Those valley moments build our faith and character. 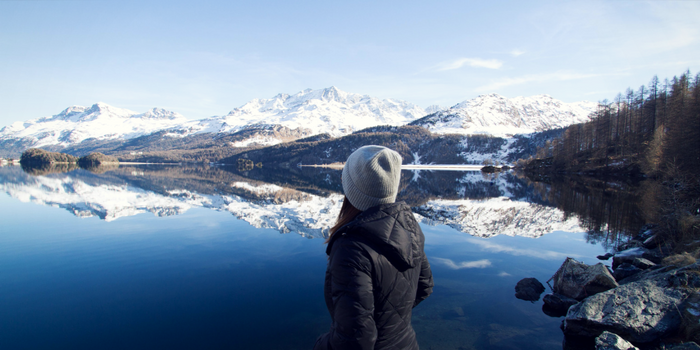 Looking back, do you only see God present in your valley? 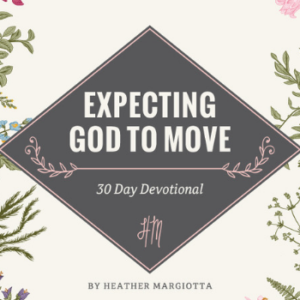 Are those the only times you are reaching out to Him and expect Him to show up? All your conversations with Jesus are full of your needs and cries for help. You spend the majority of your time asking Him why things are happening the way they are and wondering how things got to the place they are. You feel these conversations tend to be more one-sided and wonder if He even hears you. 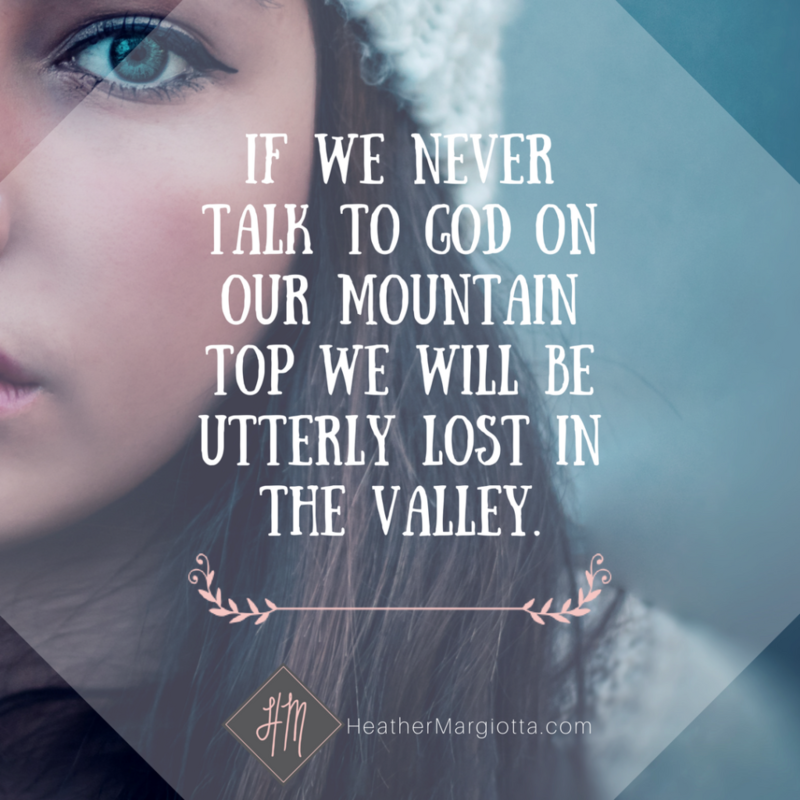 If we never talk to God on our mountaintop we will be utterly lost in the valley. We won’t know which way to go, our vision would be blurred, and we would be tempted to give up and set up camp there. However, if we’re close to God on the mountaintop then we will bring Him down with us into the valley. We’ll have a clear vision, hearts full of faith, discernment over our lives, and see the light through the darkness of the valley. We need to become people who are proactive, not reactive by talking to God on the mountain tops and in the midst of the valleys. We need to become people who talk to Him always because let’s face it- we can’t live a full and purposeful like without Him. Amen! It’s important to keep God as the the center of our lives through are highs and lows! THAT is the key. I try to live always focused on Him with a constant running dialogue with The Lord. “Pray continually…” It takes some effort at first, and then it becomes as natural as breathing, and that’s a beautiful thing! This is very convicting! I have to admit that sometimes I don’t even talk to Him until I’m through a struggle. And then I realize how easily I can make it all about me and the way I think issues should be resolved. But I desire to be in better communication with God! So very true, and how beautiful that – as you said – grace exists in the valley! So much wisdom here. I’m thankful we have a God who will listen to us whenever we come to Him, no matter the reason. Amen, and thank you for the compliment. I tell God funny jokes. I know He has heard them before but He still laughs with me. I can’t imagine a day without talking to Him. My prayer life has really grown in the last six months. And with that I have been able to see so many more of God’s blessings around me on a daily basis and I have been trying to praise Him and thank Him throughout each day. Great post Heather! Wonderful reminder: If we never talk to God on our mountaintop we will be utterly lost in the valley. Goodness, I do this to God a lot! I need to be in contact with Him in the highs and lows of life! We all do it from time to time that’s for sure. I need this today. Perfect. Thank you so much!